If there is one race in any of the Warhammer universes that usually excites me the least, it was the dwarfs. I quite like the lore for them and the aesthetic, but just something about how the army was presented always made me kind of shrug with indifference. 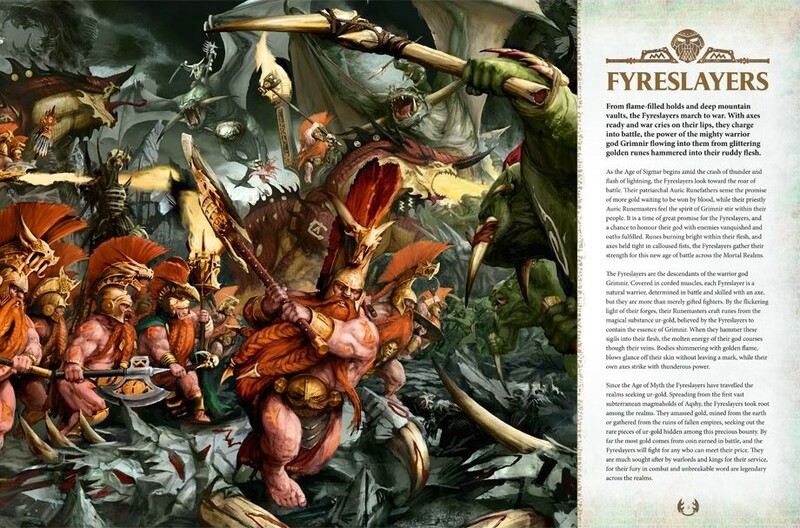 With the Fyreslayers, Games Workshop has finally caught my attention. 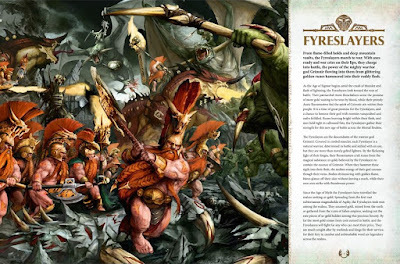 The Fyreslayers are the first re-envisioning of one of the classic Warhammer races in AoS so far. The Seraphon got a new story and feel, but all of their models stayed the same. 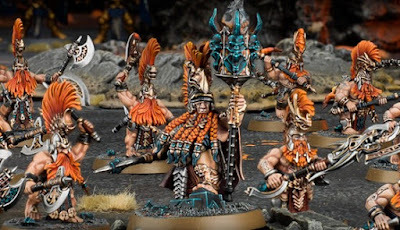 With this army GW has taken the core idea, berserk dwarfs with orange mohawks, and put a completely new spin on it, and I for one, really like it. The physical book itself is exactly what we have come to expect from GW at this point with the battletomes. It's a very nice, high quality hard cover. The cover on this one is another great piece of artwork, which I feel harkons back to what we saw on 8th edition books more then the AoS aesthetic. It's more realistic looking with a grittier feel to it. I'm pretty sure it's even the same artist who did the covers of many of the old books such as the Empire and Warriors of Chaos. The Seraphon cover is still my favorite at the moment, but this one takes a close second. When you flip open the book the first section is of course the background lore. 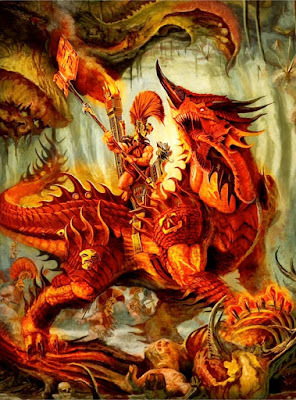 We learn where the Fyreslayers come from and who they are. We get a bit of a recap about Grimnir's story from the Age of Myth which we had previously seen in the first big book for AoS. The Dwarfen god fought the great fire salamander, Vulcatrix, in Aqshy and the two managed to kill each other. When Grimnir died his essence spread across the land, bonding with select pieces of gold which is now called Ur-Gold. To the Fyreslayers, this Ur-Gold is sacred since it contains a bit of their god. They will do anything to obtain it, which often means selling their services for payment in gold. Not all gold is Ur-Gold, but their priests can sense when some is nearby so they know when to accept payment or not. Once they have this gold they craft it into sacred runes and then hammer it into their own flesh. This brings them closer to their god and also imbues themselves with a bit of his power. The Fyreslayers live in lodges, the oldest of which is in Aqshy and is called the Vostargs. For a long time this was the only lodge stronghold, but eventually the Runefather, who is the head of the lodge, died in combat and left no clear successor amongst his Runesons. Instead of letting the lodge fall into civil war, the Runemaster, the head of the priesthood, split the lodge's wealth equally amongst the Runesons and bade them to go off and found their own lodges. This led to Fyreslayer lodges settling in all of the realms, with some even in Azyr now that Sigmar has reopened the gates. 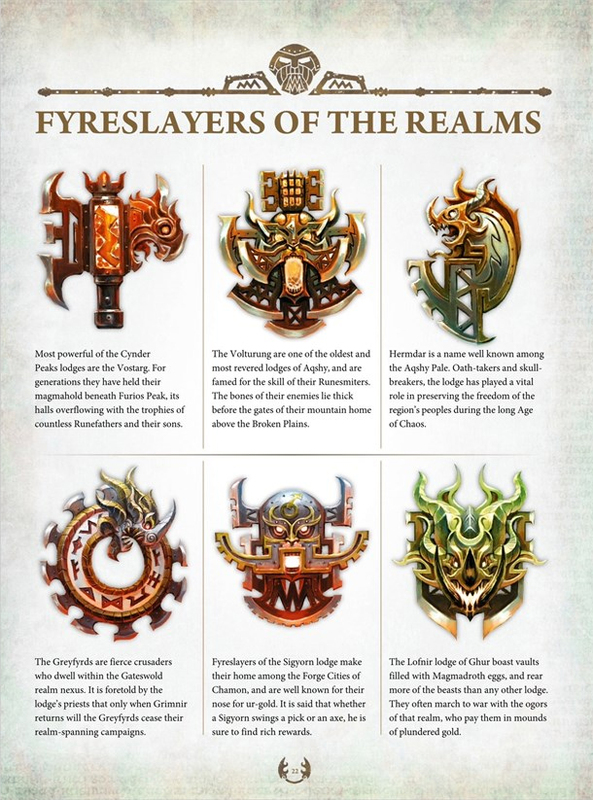 The Fyreslayers are not like the Slayers of the Old World. They have no death wish and they are not shamed. They merely honor their god, whom they lived with for many years during the Age of Myth before he died, by trying to look like him, hence the mohawks. Each lodge's stronghold is generally in some kind of volcanic area, since they do also tend to like fire a lot. You may have noticed that the Runemasters look a little bit like Chaos Dwarfs, which is no accident. The priesthood is even called the Zharrgrim. 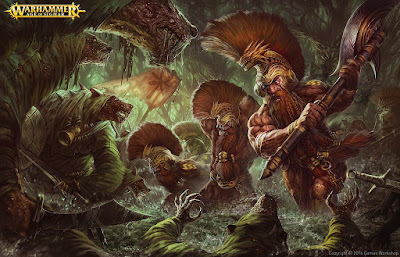 Chaos Dwarfs were called the Dawi-Zharr. They both also really, really like fire. They never come out and say that this is where the priests come from, but it's heavily implied. It looks like the Chaos Dwarfs, or at least a segment of them, have repaired relations and are now integrated into their society. Whether they explore this more, or just leave it as a little nod to the World-That-Was, it's a fun addition to the army. 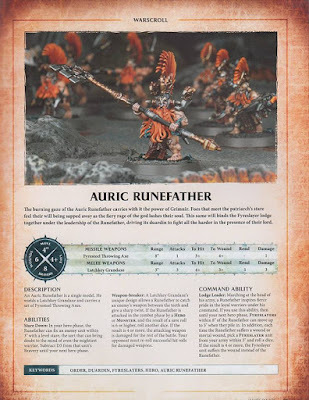 What makes this even more interesting is that Forge World just released a new Chaos Dwarf model for Age of Sigmar, so apparently those guys do still exist in the new lore. As always the artwork is fantastic and GW continues to impress with their output for AoS. There are one or two bad pieces in the book, but they are outweighed by all of the really well done ones. Once we move past the main chunk of lore we get to the individual unit descriptions. There aren't as many units in this book as other armies have gotten, so it's a little short in length, but not in quality. Each unit and hero gets fleshed out a little more and I feel like I have a pretty good understanding of who they are, not just what they do. This was a trap that the Seraphon book fell into that thankfully the Fyreslayers have sidestepped. We also get a timeline in here with a bunch of little story hooks in the form of past battles and major events. It starts with Grimnir fighting Vulcatrix and goes on past the arrival of the Stormcast. As always, I really like these timelines since it gives you a bunch of potential ideas that they can come back to later, or the hobbyist can use to theme their own forces or battles. Usually the army colors pages come off a little boring to me. How many colors can you see Bloodbound painted in anyway? 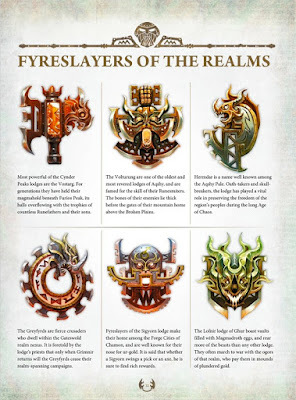 They do provide some cool alternative color schemes though, and for some reason I found the Fyreslayer's section more compelling then the past ones. Not only do we get to see the colors of a few different lodges, but we also get to see the Lodge symbols, their name, and a brief description of them. I'm particularly interested in the ones from Azyr, as well as the one from Shyish and the Lodge from Ulgu whose symbol looks suspiciously Dark Elfish. This is very well done with great artwork for the Lodge symbols. The first battleplan revolves around a horde of Bloodbound assaulting the lodge of the Vostarg in Aqshy. 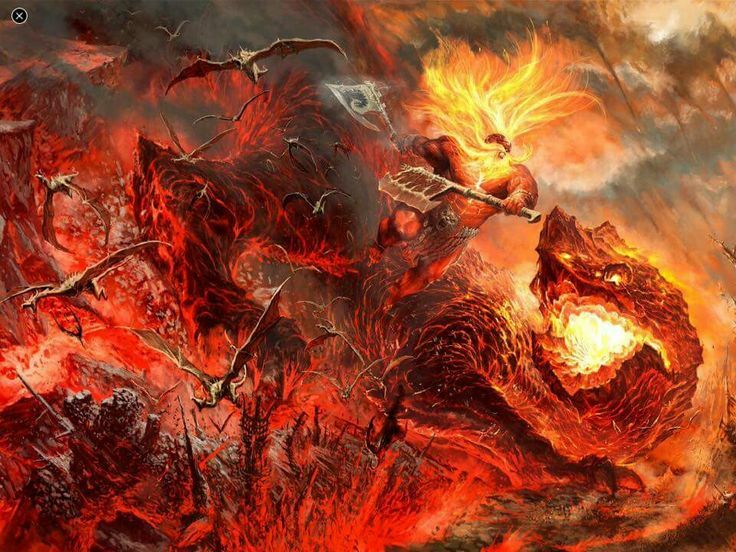 There's plenty of fire and lava flying around and the story for it is pretty entertaining. A particularly evocative moment involves a waterfall of lava (lavafall?) blocking the Chaos forces from reaching the Fyreslayers, at least for awhile, until the madmen just start running right through it anyway. This is actually a major part of the scenario as well. The board is split in half with each force deploying on the opposite end long ways. So they're deploying on the short ends. Running across the middle is a wall of lava with only a 12" wide tunnel in the middle for the Chaos forces to get through. Their whole objective is to breakthrough the Duardin battle lines and exit off their table edge to attack the Fyreslayer hold. They can run through the lava if they want, but run an extremely high risk of dying before they even get to do anything, unless the use their special command ability. This allows them to run through, shoot, charge, and attack, and then role to see how many of them die from their horrible lava related wounds during the Battleshock phase. It's very thematic. The whole scenario seems like a ton of fun and is my second favorite of the bunch. The Second battleplan focuses on an army of Fyreslayers hired by some poor mortals in Shyish to help overthrow their tyrannical Vampire lord who rules over them. I of course love all things having to do with the Realm of Death and this is no exception. This is the stand out battleplan for me. The story is compelling with some of my favorite artwork from the whole book. Once the dwarfs get into the vampire's lair there is a literal rain of zombies falling from the sky. This comes across in the battleplan itself too, with zombies suddenly appearing about half way through. You have to roll for them when they appear though because there is a chance that they could land to hardly and splatter all over the ground, dying before you get to use them. The coolest thing for me about the whole scenario is the way it's set up. The board is divided into two foot square sections with certain areas blocked off so they aren't visible until you round a corner. The Fyreslayers have to snake their way through the board, not knowing what will be in the next section until they get there. It really has a strong dungeon crawler feel to it. It's nice to see GW playing with the standard four by six table we are used to. AoS has let them open up what they can do and come up with seemingly obvious, yet highly creative and fun scenarios like this. This never would have been possible in 8th edition and I don't think I have seen anything like it in 40k either. The Fyreslayer's objective is to kill the enemy general, who awaits in the last section like a video game boss. It's fantastic and I definitely want to try this one out. The final battleplan centers around a lodge of Fyreslayers hired to remove a nest of Clan Pestilens Skaven and their foul warp stone monument. For me this had the weakest story as well as the weakest scenario. The one cool thing about the scenario is that before the game begins, the Fyreslayer player has to declare whether their forces are advancing cautiously, steadily, or speedily as the Skaven lair is in a swampy bog. If they advance cautiously they suffer no ill effects, but the skaven player gets two free turns before the Fyreslayers even get to do anything, effectively allowing them to reposition themselves. 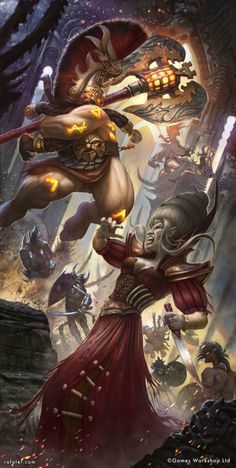 If they advance steadily the skaven only get an additional free hero phase, but the Duardin potentially start taking casualties before the game even starts, and if they advance speedily the skaven get no bonuses, but the Fyreslayers suffer even worse. It's a really cool mechanic to help add some story into what we all know happens before battles. The rest of the game involves the Fyreslayers attacking the warp stone monument at the center of the table, attempting to unroot it. The whole time the skaven are trying to finish a ritual with it, which gives them bonuses the closer they get to completion. It's by no means a bad scenario, it's just a little similar to past ones I have seen and is the weakest of the three in this book in my opinion. After all of the battleplans we get to the warscrolls for each unit. There's nothing particularly fancy here. There are three main units and six heroes, three of which have a warscroll for a mounted version and a version on foot. It's a fairly small army, and I think was designed with the idea of allying to a larger force for bigger games. The battalion formations are characterful and nice additions to the army. 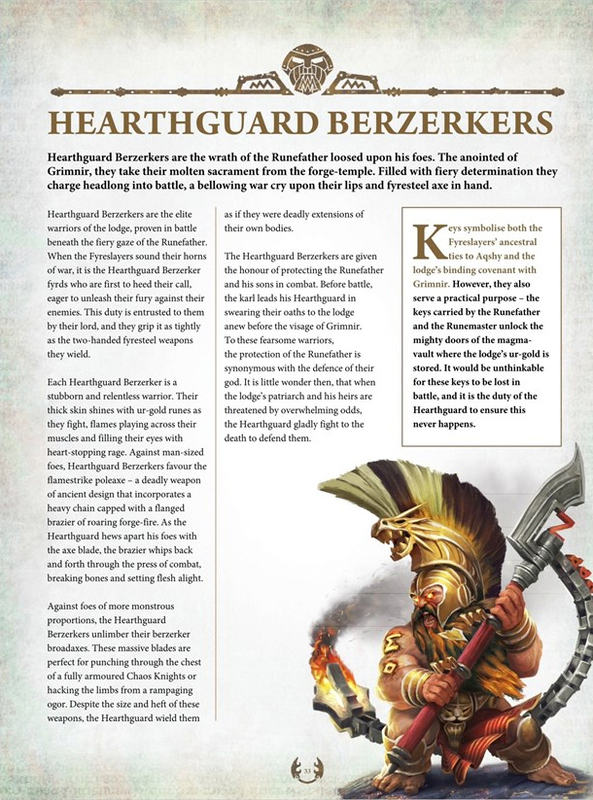 There is basically one for each hero with the type of units attached to them that would make sense, such as Hearthguard with a Runemaster. The only downside for me, is that every one of them includes a Magmadroth. While it's a great model, and I understand why they would want to include on from a sales point, I wish there was a smaller formation without one. I don't think I'll ever do a large Fyreslayer force, mostly just because of time limitations, but I would like to ally some to my Stormcast. A Magmadroth is probably too much of a commitment for a small allied force for me, so it would have been nice to have a formation for me to aim to complete that just had footsloggers. 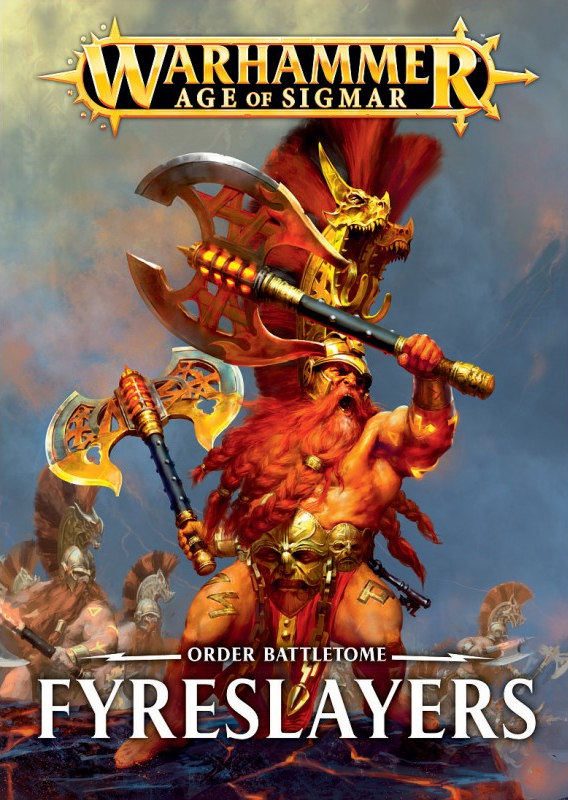 Overall I think the Fyreslayers Battletome was very well done and thoroughly enjoyed reading it. It definitely gave a better sense of the army outside of the battlefield when compared to the Seraphon book. I think this is a really important point, since we all want to believe that these armies really exist in this setting, which means they need motivation and they need purpose outside of war. The Fyreslayers are a great evolution of the classic Slayers we are used to from the old Dwarfs and feel completely natural within the AoS setting. 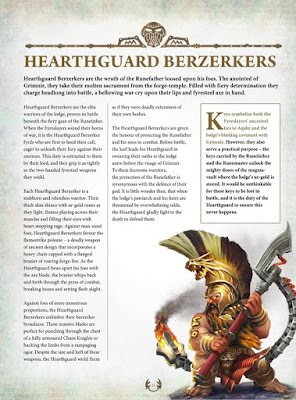 I definitely want to add some to my Stormcast at some point, if not a whole unit then at the very least a lone Grimwrath Bezerker. 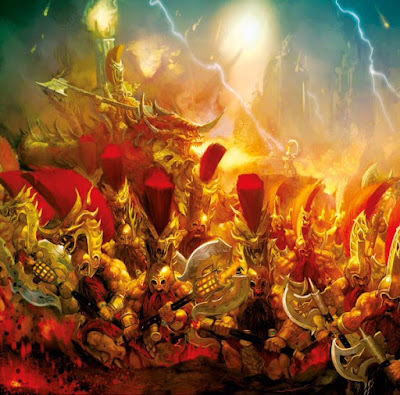 I think this Battletome is very encouraging with where GW is going to take AoS in the future, as well as their abilities to create new and engaging forces. The only downside is the small unit count. They could work fine as a force of their own but I think are ideally meant to be allied with other forces. I have a feeling that this is how a lot of the new armies and books for AoS will be going forward outside of the Grand Alliance books, and I'm perfectly fine with that. While I probably wouldn't have the time or funds to start a whole new army very frequently, painting up a small force like these guys is completely feasible. If you like the Dwarfs I highly recommend this book. 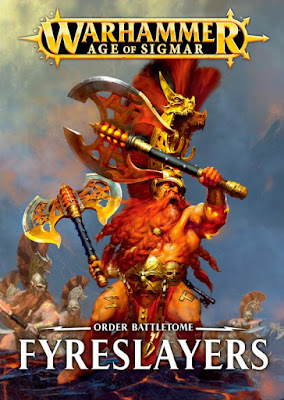 If you just want to keep up on what's going on in the ever evolving lore for AoS this also is a good choice with some intriguing stories and innovative battleplans. I would also be remiss if I didn't mention how great the entire model range is for the Fyreslayers. The only slight hiccup are the couple of goofy poses on the Vulkite Bezerkers, but overall I really like everything they did with the sculpts.